WASHINGTON (January 23) -- One of President Bill Clinton's attorneys, who has not had a prominent public role to this point, argued for the president's case before the Senate. 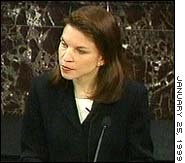 Nicole Seligman, a partner at Williams & Connolly, was the second woman to speak for the president on the Senate floor. "The moment has arrived where the best interest of the nation, the wise prescription of the framers and the failure of the managers' proof all point to dismissal," Seligman argued to the 100 U.S. senators. "You have listened. You have heard. The case cannot be made. It is time to end it." Seligman, 42, has an impressive resume. She was on the legal team that represented Lt. Col. Oliver North in his Iran-Contra trial, working with North's lead attorney Brendan Sullivan. She clerked for the late Supreme Court Justice Thurgood Marshall and was considered one of Marshall's all-time favorite clerks. The New Yorker, whose father and sister are also lawyers, received a undergraduate degree from Radcliffe and edited the Law Review while studying Law at Harvard. A Harvard and close friend of Caroline Kennedy Schlossberg, Seligman represents many media organizations, including CNN in the Tailwind matter, ABC, and occasionally the National Enquirer, although David Kendall, the president's lead private counsel, is the prime attorney from Williams & Connolly for that account. Seligman once worked as a reporter, on the staff of the Wall Street Journal's Asia edition, living in Hong Kong. White House Counsel Charles Ruff, Deputy White House Counsel Cheryl Mills, and Special White House Counsel Gregory Craig have already joined Kendall in presently the president's case to the Senate.